This is plate 9 from James Fergusson's 'Illustrations of the Rock Cut Temples of India'. The splendid chaitya (Buddhist prayer hall) of Cave 19 at Ajanta has an elaborate interior to match its decorated exterior. It has been said that the fine sculptures reveal some Hindu influence on the accomplished Gupta age of the fifth century. The interior has two rows of columns forming three aisles. The capitals of the columns are elaborately decorated with figures of seated Buddhas, flying couples and musicians. The central aisle has a vaulted ceiling while the side ones have flat roofs. 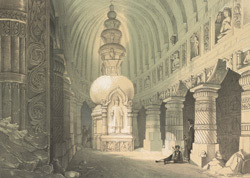 The stupa (monument) at the end marks a change from the more austere, squat earlier forms to an elongated version where the tiers of umbrellas reach the roof and there is a large standing Buddha image in a niche in front of it.